Kilmarnock recorded a dramatic first win of the season to move off the bottom of the Scottish Premiership and above Dundee United. The result eases the pressure on the visitors' manager Gary Locke, but heaps more on United boss Jackie McNamara. 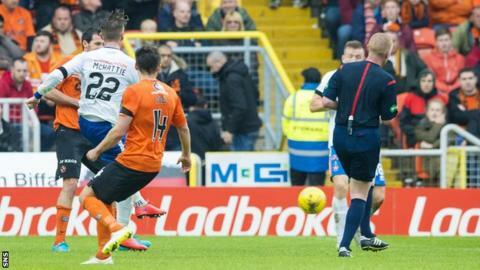 A Kallum Higginbotham penalty had put Killie in front before Billy McKay equalised with a spot-kick of his own. But debutant Kevin McHattie fired a tremendous long-range winner to stun the home support. United had bombarded the Kilmarnock goal in the second half, only to find Jamie MacDonald in inspirational form. The goalkeeper produced outstanding saves to keep out McKay and Ryan Dow as they pressed for the winner. He was mobbed by his team-mates at full-time as they acknowledged the role he played in the victory. It was clinched, though, by an unlikely hero in McHattie, the full-back rifling in a low shot past Luis Zwick. United will feel hard done by, having dragged themselves back into the match, but their profligacy in front of goal was their undoing. They found themselves behind initially when Rory McKenzie nipped in in front of United captain Sean Dillon, who reacted slowly, catching the Kilmarnock winger and prompting referee Brian Colvin to point to the spot. Higginbotham sent Zwick the wrong way with an expertly-taken penalty, high into the United net to give his side a half-time advantage. If there were few arguments about that award, the equaliser came in more controversial circumstances. Blair Spittal fired a volley goalwards, Lee Ashcroft threw himself in the way of the shot, with the ball coming off his arm. Despite his protestations, Ashcroft's handball was deemed deliberate by referee Brian Colvin and McKay slotted the penalty down the middle to level the scoring - his first goal for United. As United swarmed forward, there seemed likely to be only one winner, but that did not allow for the performance of MacDonald and the late cameo from McHattie. Match ends, Dundee United 1, Kilmarnock 2. Second Half ends, Dundee United 1, Kilmarnock 2. Attempt saved. Aaron Kuhl (Dundee United) right footed shot from outside the box is saved in the top centre of the goal. Hand ball by Darryl Westlake (Kilmarnock). Corner, Kilmarnock. Conceded by Mark Durnan. Goal! Dundee United 1, Kilmarnock 2. Kevin McHattie (Kilmarnock) left footed shot from outside the box to the bottom right corner. Attempt missed. Aidan Connolly (Dundee United) left footed shot from the left side of the box is high and wide to the left. Attempt missed. Aaron Kuhl (Dundee United) right footed shot from outside the box is close, but misses to the left. Attempt blocked. Billy McKay (Dundee United) right footed shot from the centre of the box is blocked. Corner, Kilmarnock. Conceded by Callum Morris. Attempt saved. Ryan Dow (Dundee United) left footed shot from the centre of the box is saved in the bottom right corner. Attempt missed. Darko Bodul (Dundee United) left footed shot from the centre of the box is close, but misses to the left. Attempt saved. Billy McKay (Dundee United) right footed shot from the centre of the box is saved in the centre of the goal. Substitution, Kilmarnock. Scott Robinson replaces Craig Slater. Attempt missed. Aidan Connolly (Dundee United) left footed shot from outside the box is just a bit too high. Billy McKay (Dundee United) hits the left post with a left footed shot from the left side of the box. Aidan Connolly (Dundee United) wins a free kick in the attacking half. Substitution, Kilmarnock. Kris Boyd replaces Josh Magennis. Darryl Westlake (Kilmarnock) wins a free kick on the left wing. Foul by Greg Kiltie (Kilmarnock). Ryan McGowan (Dundee United) wins a free kick in the defensive half. Foul by Tope Obadeyi (Kilmarnock). Substitution, Kilmarnock. Tope Obadeyi replaces Kallum Higginbotham. Substitution, Dundee United. Aidan Connolly replaces Blair Spittal. Substitution, Dundee United. Darko Bodul replaces Adam Taggart. Stuart Findlay (Kilmarnock) is shown the yellow card for a bad foul. Ryan McGowan (Dundee United) wins a free kick on the right wing. Foul by Stuart Findlay (Kilmarnock). Corner, Kilmarnock. Conceded by Sean Dillon. Goal! Dundee United 1, Kilmarnock 1. Billy McKay (Dundee United) converts the penalty with a right footed shot to the centre of the goal. Lee Ashcroft (Kilmarnock) is shown the yellow card for hand ball. Penalty conceded by Lee Ashcroft (Kilmarnock) with a hand ball in the penalty area. Foul by Aaron Kuhl (Dundee United). Jamie Hamill (Kilmarnock) wins a free kick in the attacking half. Attempt missed. Craig Slater (Kilmarnock) right footed shot from outside the box is just a bit too high. Attempt missed. Scott Fraser (Dundee United) left footed shot from outside the box is close, but misses to the left.